A photograph of a total solar eclipse taken from an 20 March 2015 total solar eclipse from 35,000 ft from above the Norwegian Sea on a B737-800 aircraft. While cloudy weather may block some people's view of the total solar eclipse on Aug. 21, Glenn Schneider has a backup plan. Schneider, an eclipse chaser who has witnessed 31 total solar eclipses (and two annular eclipses), dodges bad weather and other nonideal viewing conditions by taking to the air in a commercial plane, rising above the clouds to see the rare events from the air. Most of the time, he hunts total solar eclipses, with the occasional annular solar eclipse thrown in for good measure. "The magnificent view of the lunar shadow as it sweeps over the Earth seen from on high looking down rather than standing on the ground looking up, it has a very different feel to it," Schneider said. "It's those sort of combinations of things that are sort of unique when you put it all together from aircraft." Schneider saw his first eclipse from the ground, and it took place in 1970 in North Carolina. Over the next decade, he traveled around the world to observe the events from the ground in Australia, Kenya and Indonesia. It wasn't until October 1986 that he first observed an eclipse from the air, over Iceland and Greenland. Schneider said that eclipse was "a little bit of a roll of the dice." The umbral shadow for that eclipse (the region where the moon completely covers the sun) was small, only about 0.6 miles (1 kilometer) wide, and visible for only a few seconds and only along a thin strip of sea between Iceland and Greenland. The aircraft, called the Cessna Citation II, needed to hit a very thin, fast-moving strip, "and this was in the days before GPS navigation," Schneider said. A small airplane that's used to ferry eclipse chasers to more favorable viewing conditions. The trip was a success, and Schneider described it as "thrilling." The apparent sizes of the sun and moon were so well-matched that the sun's inner atmosphere, called the chromosphere, was visible as a red ring around the disk of the moon. (The moon's elliptical orbit means that its distance from Earth changes throughout the year, altering the apparent size of the moon in the sky. The Earth's distance from the sun also varies.). As the sun's disk peeked out through the mountain valleys on the moon's surface, the in-flight observers saw the eclipse phenomena known as Baily's beads, or drops of sunlight sparkling along the lunar edge, which Schneider said no one had spotted from the air before. A sandstorm in Kenya in 2013 forced Glenn Schneider and a group of eclipse observers to take to the air to see the celestial event above the dust. "They danced around the edge of the moon for 5 seconds or so," Schneider said. "It was a pretty remarkable remembrance." Since then, Schneider has taken to the air six more times to spot eclipses. In addition, he has arranged flights for other groups over the years. Another spectacular event occurred in 2002, over the dry desert of Australia, when an eclipse occurred just after sunset. Schneider said that most eclipse chasers don't try to watch an eclipse around sunrise or sunset because of the higher chance of clouds. He decided to risk it over the dry desert. During a normal total solar eclipse, the moon's inner umbral shadow races towards the observer, crosses the sun from west to east, and then races away. But for a sunset event, things happen a little differently. "What we saw in 2002 was not seeing [the shadow] continuing over the landscape but literally lifting back up," Schneider said. "We saw sort of a dwindling smaller oval of the moon's shadow as it ascended into the atmosphere and disappeared. It was a pretty amazing sight." While most of his airborne eclipses were arranged well in advance, Schneider's in-flight view of the 2013 eclipse over northern Kenya lacked the same structure. He had plans to view the event on the ground near Lake Turkana, but a sandstorm that showed up about an hour before the appearance of the moon's shadow created problems. A break in the storm allowed the group to get into the air in the Cessna 208B, a light aircraft that they kept as "eclipse insurance" should they need to move to a different site. On larger aircraft during planned trips, passengers usually peer out the windows. But the smaller, unpressurized plane allowed for a different view. "We opened the big cargo bay door in the back," Schneider said. With no seats — because the group didn't plan to be up in the air — and no parachutes, the team spent the 11 seconds of the eclipse behind the split door, the bottom half closed while the top was open. Schneider said they were fortunate that the clouds topped out at 11,000 feet [3,400 meters], as the plane could go no higher. This image of a total solar eclipse is a digital composite of nine individual exposures on Kodachrome-25P film, captured by eclipse enthusiast Glenn Schneider on June 21, 2001, above the Zambezi National Park in Zambia. Like watching from the ground, viewing an eclipse from the air requires a great deal of planning. Schneider works with charter companies around the world for his flights. "You want to work out your planning well in advance with the charter company or aircraft operation," he said. Coordinating with the flight crew, especially, is "absolutely essential." Unlike most flights, eclipse expeditions require detailed planning that can change depending on when you take off. These outings require multiple flight plans in case you take off 5, 10 or 15 minutes later than originally scheduled, Schneider said. Unfavorable winds can also affect travel time, so planners must account for wind as well. Aircraft-control constrictions also factor in, because a delayed flight time can create major problems, Schneider said. "Once the moon's shadow has passed over your intercept point, it's gone," Schneider said. He tries to get up in the air as early as possible and have built-in, in-air contingencies for the flight, he said. Planning starts long before the plane takes off. Ideally, the charter company will bring the plane in a day or two in advance to allow Schneider's groups to remove the seats, so the passengers can peer through the windows at more angles, he said. Because Schneider chases eclipses all over the world, he's rarely able to use the same charter company twice. However, in 2015 he was able to work with the same company and flight crew he had relied on in 2008. Schneider and eight other eclipse chasers in 1986. The group viewed the event from an airplane, which can be seen behind them. "Having second-timers, we didn't have to start from ground zero in them understanding what to do," Schneider said. However, working with people who have never previously chased eclipses by plane has never been a problem. "I've gotten great cooperation with any charters," he said. Schneider said he sets up flight paths to maximize viewing angle rather than extend the duration of the eclipse, though on a 2010 flight out of Tahiti, the group spent 9.5 minutes in the lunar shadow. "That's incredibly long," he said. "The most nature allows [from the ground] is just over 7.5 minutes — and that won't happen again for a few hundred years." Once the intercept with the shadow is assured and the flight management system is flying the plane, the pilot and first officer take turns peering out the side windows of the flight deck at the eclipse, Schneider said. "It's actually an amazing thing to see the lunar umbra as an inverse searchlight coming at you from over the horizon, hundreds of kilometers away," Schneider said. "It's something you only get from the perspective of an airplane." 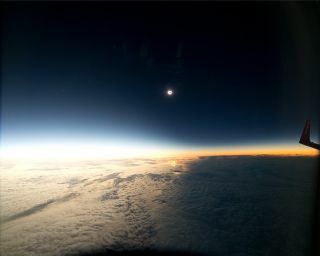 A hybrid eclipse viewed from an airplane in 2013. Schneider said that while he loves the unique views available in an airplane, the ground is always his first choice. "My preference is to be stable and have my feet on the ground," he said. "I love the open sky above me." Why take to the skies, then? Generally, he does so only when there are major challenges in observing an eclipse from the ground, such as when there was a thin slice of shadow between Iceland or Greenland or foul weather in Kenya, he said. "It really is a matter of logistics or clouds that drives me to using aircraft," he said. While eclipse chasers enjoy the thrilling view, researchers have their own reasons for taking to the skies during an eclipse. Because they rise over the clouds and most of the atmosphere (which blurs light from space in some wavelengths), airplanes can provide opportunities for incredible science, Schneider said. For instance, two refit bombers will launch from Johnson Air Force Base in Texas to study the sun and Mercury during the 2017 eclipse. Still, Schneider said, because of the unique perspective an airplane provides, he encourages die-hard eclipse chasers to take the opportunity to see an eclipse from the air at least once. For the upcoming eclipse, he will be feet-down in Oregon, peering up at the sky, though he's trying to set up a contingency that would either take him to another site or allow him to watch from the air should he get caught under clouds. He encouraged everyone within range of the eclipse to make their way to the path of totality. "There's no such thing as an almost-total eclipse," he said. Many people seem to think that if they are close to the path, they will get the same show as those inside the path, he said, but that's not the case. "It's completely different." Because the Aug. 21 total eclipse will cross the country from Oregon to South Carolina, nearly all of the residents of the continental United States will be within a day's or two day's drive from seeing the event in full. The last time a total eclipse brushed the lower 48 was 1979. "If at all possible, if you don't live in the path of totality, take the day off of work or school," Schneider said. "It's an amazing opportunity."